I finished this quilt top. Calling it Blue Wave and Emma called dibbs on it. For her “new” room (Sarah’s old room) she wants to paint the walls blue. It’ll be a while until we get to it though. We have to do Meaghan’s room first. 😉 I’ll piece the back from some of the scraps (not much) and use a LOT of what. 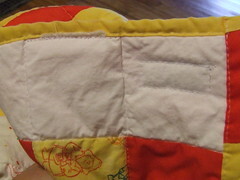 No idea on the binding or the quilting. I would *love* to do an allover stippling or waves, but my skill level is not there. 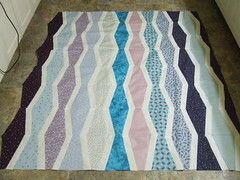 I also finished this top last Friday, but didn’t get a recent pic. All that needed to be done was sew two borders on the side. 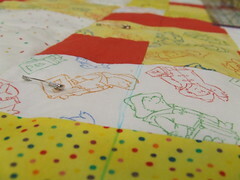 The blocks had all been sewn together, and the first two borders were on. They are also black. 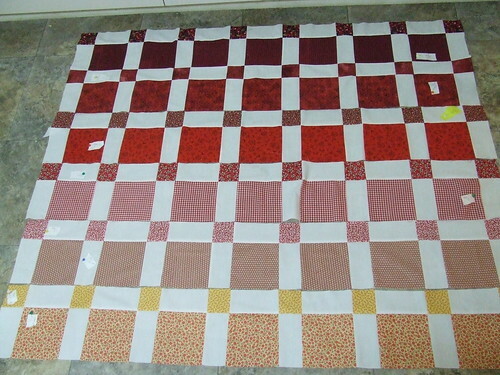 I will back this with black fabric and quilt it with black thread. No idea on the pattern yet though. Our local quilt store, Christmas Crab Quiltery, has a free sewing afternoon pretty much every other Friday. they have a wonderful large shop with a second room all laid out perfect for classes. It’s HUGE! 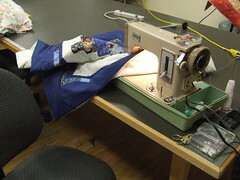 It is also heavenly to sew in. it had been snowing all morning, and while it was not stormy (at least by Maritimer standards), it was steady so I got Ron to drive me in. I was the only gal who showed up, which was fine, because that meant I got the BEST table all to myself. 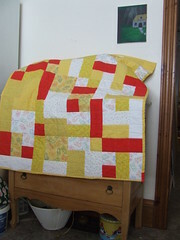 I also brought in a few quilts tops that were all finished so I could show them off. Jo & Shelly have a slightly different style than I do, and many of the fabrics in the shop reflect that style – deeper, darker colors, lots of beige, brown, rust navy – great colors, but not always me. 😉 I prefer brighter colors and modern contemporary patterns. even the pattern I bought there I did different than their sample. 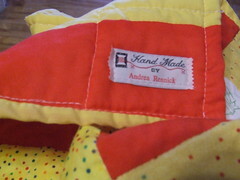 That’s the awesome part about quilting. Shelly has a blog here, go read it. She noticed I use a lot of cherry fabric when I can find it, so I joked that she’ll probably call me as soon as they get any fabric in with cherries. I got a LOT of work done. The central table was large enough for me to spread out the way I like and work best. The iron was all set up, hot and waiting. Company was awesome, and there was even hot chocolate. What more can a gal ask for? 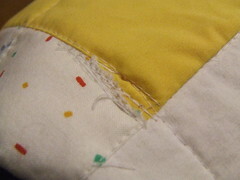 I did not even get upset when I discovered I had sewn some quilt blocks in the wrong order and will have to take out three seams. It was no biggie because everything else went that much smoother. Probably not a good idea of me to wear my polar fleece sweater though. I have thread snippets stuck all over me. I am going to make this a regular habit, as I can see how very useful it will be when I finally get around to quilting some of these tops. At least it will be sooner than it is possible for me to get a new craft room. Kinda like having my cake and eating it too, even if it’s at someone else’s place. My back hurts from being hunched over my machine, and I am really tired & sleepy (plus wound up from the chocolate) but my creative soul is happy. I have half a chapter left to edit, and a pile of screenshots to sort out, but after a good night’s sleep I’ll be refreshed. At least I hope so. 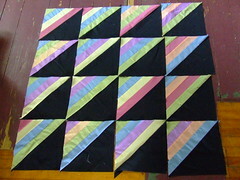 This one takes longer to sew, because of the angles, so I spent about half my time on it.